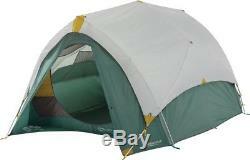 ThermaRest Tranquility 4 Tent Group Camping Shelter, 4 Man Silver Pine. Freestanding 4-person tent with multiple set-up options & a backpack style carry bag. Silver Pine - Mercury/Silver Pine/Honey. The Thermarest Tranquility 4 tent is built for campers looking for comfort and space without the weight and size penalty of a larger family tent. The Tranquility 4 delivers plenty of space with the versatility of a backpacking shelter. The 68D polyester ripstop canopy and fly is tough yet lends itself to a lighter design that folds down to be carried in the included backpack style storage bag. The freestanding design is easy to pitch thanks to colour coded poles with a hub design. An independent rainfly lets you pitch the inner alone for a fully ventilated summer shelter thats perfect for stargazing. The rainfly is quickly attached to manage cooler, wetter conditions with full-coverage and a 1500mm PU waterproofing to protect from rain. For campers looking to add even greater versatility and sun/rain protection the Tranquility 4 Wing has been designed to work alongside the Tranquility 4 Tent. The independent rainfly provides peak and side wall venting for maximum sunny and bad weather ventilation. This gives you a light and airy shelter for warmer weather camping and ensures a good level of ventilation even in cooler conditions. Two doors ensure hassle-free entry and exit with integrated vestibules keeping rain clear of the inner tent. Mud mats take care of dirty footwear while interior pockets provide organization for camping essentials with utility loops for hanging wet clothing outside the tent and out of the weather. The whole tent packs down to fit in the included backpack stuff sack to make it highly portable for those opting to hike into their campsite or take the long walk from the car park to set up basecamp. Whether you're car camping, travelling, heading to an outdoor festival, or camping with friends and family, the Tranquility 4 tent from Thermarest delivers a luxury shelter crafted for outdoor comfort that adapts to the weather come rain or shine. Spacious & highly liveable 4 person tent. Independent Rainfly - use with or without rainfly to suit conditions. Free-standing design for hard to pitch sites. 2 Integrated vestibules on main tent body. 5-hub pole structure makes set-up quick & easy. Easy entry with door at either end. Multiple guying points add stability in windy conditions. Integrated mud mats, pocket organization & utility loops. Peak Ventilation - independent rainfly provides peak & side wall venting for maximum sunny & bad weather ventilation. Fly Fabric: 68D Polyester RipStop 1500mm PU. Floor Fabric: 150D Polyester Oxford 10,000mm PU Coating. We are Absolute-Snow , the UK's leading independent retailer of extreme sports equipment and associated fashion clothing. We have a shop in Hemel Hempstead, Hertfordshire and visitors are most welcome. We price check all our competitors every week. We will price match if you find a better offer elsewhere. Please send us a link to where you have found it cheaper. Visitors to our shop, please refer to our Absolute-Snow website for our address, maps, road direction and our opening hours. The item "ThermaRest Tranquility 4 Tent Group Camping Shelter, 4 Man Silver Pine" is in sale since Wednesday, April 3, 2019. This item is in the category "Sporting Goods\Camping & Hiking\Tents & Canopies\Other Tents & Canopies". The seller is "absolute-snow" and is located in Hemel Hempstead, HP3 9HD, UK.